i can't wait until brittany comes home for the summer. she is my painting enthusiast! for my birthday one year she painted my living room the great adobe red color it is now. two summers ago i was gone for a five day temple hill choir tour, and when i came home she had totally painted her own room, leaving daisy yellow in the dust, and taking on a bold (and i mean bold!) hot cranberry'ish deep pink color. i had no clue she was going to do it - and in the time i was gone she had taken her room apart, painted it (like 3 coats too, cuz it's dark & bright) and had it all put back together. could be risky with some people, but brittany has an amazing eye for color, and all things aesthetic, so it totally worked...and i didn't have to deal with any of the chaos of a torn up house while it was happening. can you say 'win-win'? well, do i have some projects waiting for her! challenge #1: poor cole lives in a room right now that any mom of a baby girl would adore! the pastel patchwork wall paper with pink sponged molding and mini valence that took my breath away as a nursery for rochelle just isn't cutting it for my car-driving, bakugan-playing, rock-collecting, lego-constructing boy. great part is...i've been put on notice to not start the bedroom make-over until britt gets home. ha! think i'd cross that one? think again. so while looking for truly BOY colors that would work with all the white book shelves that are already built in, and white dresser that's not getting replaced, i found this at pottery barn. 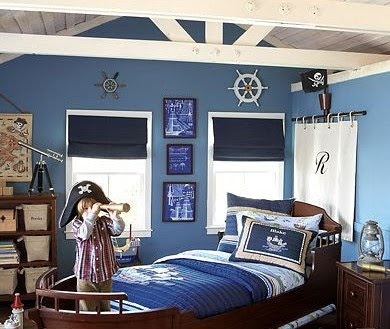 (not the room, just the color) bamm! sold! 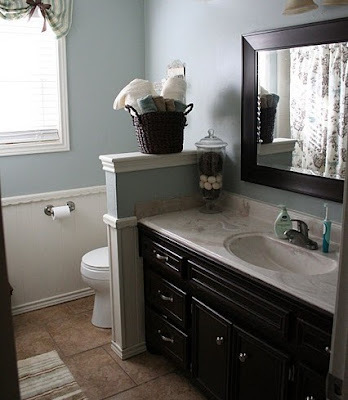 challenge #2: while keeping my eye open for bedroom ideas, i found another pic that inspired me to take on re-doing the bathroom while she's home as well. i have very light pinkish tinted cabinets in the hall bathroom. hard to find a paint color that works in there. besides, who wants to redo the accents for something they don't much like in the first place? (me either) but then last night i found this! i LOVE it. never thought of painting my bathroom cabinets black. and those blue walls - so soothing! mark would roll his eyes, but britt will take this on in a heartbeat! ooo! i'm so excited! like i said...hurry home! it's gonna be a GREAT summer!